Fantastic location, close to everything. Spacious, very comfortable and sparkling clean. Wonderful host. The room was large and the bed was comfortable. The thermostat was locked, so it wasn't possible to adjust the temperature - but it was generally warm enough. Water pressure in the shower was good and the water warm enough for back-to-back showers. A small refrigerator kept drinks cold and there was a small coffee table and a standard large dining table in the suite. Directions were clear and the building sufficiently quiet most nights. Karen arranged a way for us to leave a key and depart early for a morning flight outside of standard check-out hours. Great location in Old Town and close to several great coffee shops, breakfast places and restaurants. Even a small mini-market directly downstairs. Karen , the host is in the apartment waiting and even help us with the luggage, gave us pointer and recommended the hotel across for a good breakfast, centrally located and close to old town square. Very large and clean apartment with lots of yummy restaurants and sites to see. Also, a couple of convenience stores are located nearby for the essentials. Fantastic host and location! 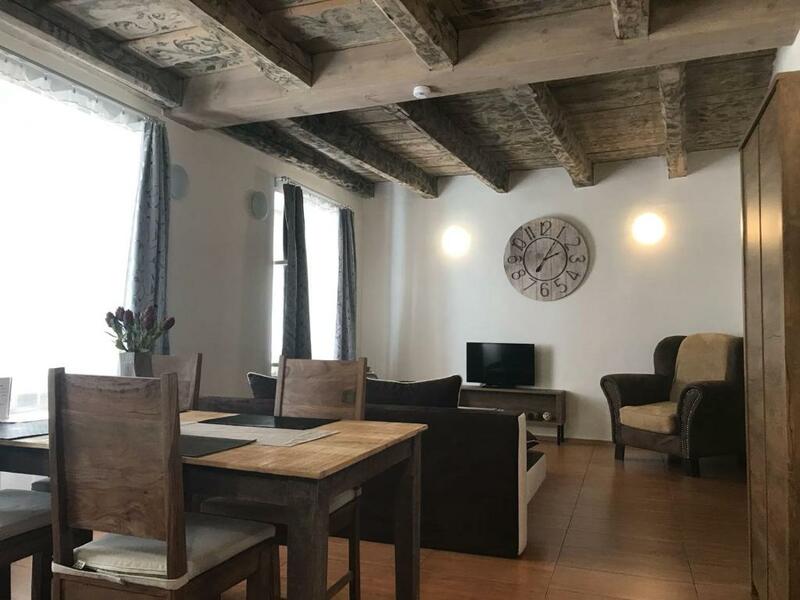 A beautiful apartment with a central location with close walks to Old Town Square and St. Charles bridge, yet off the beaten path for a quiet nights sleep. The host, Karen, was a fantastic help and arranged transportation to and from airport, map, advice, tidbits, and just an all around nice and interesting help. If we ever get the privilege to return to Prague, we will stay here again. The hotel's breakfast was right across a small street and was a fantastic buffet. Really recommend his place to everyone! Exceptional communication with a perfectly located apartment (2 blocks from Town Square), comfortable beds and great AC and WiFi. The check in and check out was easy and luggage storage before our flight was fantastic. Bed and beddings were just perfect for good sleep. Little bit noisy at the beginning of night. The owner is very friendly and helpful, gave as lot of information on the city tour and places to eat. Kitchen has everything you need, but tiny and it is not convenience for two people go through the kitchen to the bathroom. Bedroom is spacious, and another room you enter has a very good couch for having nice sleep also. Easy and comfortable. The owner of the apartment was there waiting with the keys. As soon as I got out of the taxi he was there to guide me to the apartment. Apartment was simply Wow - in the heart of the beautiful Old Prague. Apartment is spacious, stylish and just excellent for your first impression about the city and to have some rest after a long trip. The owner was extremely helpful by answering all questions what the traveler may have - how to get where, where to eat, what to see... Thank you Karen for taking care and for looking after me! 1000% recommended accomodation for any type of visit! Lock in a great price for U Zeleného jalovce – rated 9.5 by recent guests! U Zeleného jalovce This rating is a reflection of how the property compares to the industry standard when it comes to price, facilities and services available. It's based on a self-evaluation by the property. Use this rating to help choose your stay! Located in a building that is a cultural monument in the center of old Prague, a 5-minute walk from the Old Town Square, U Zeleneho jalovce offers apartments with free WiFi access and air conditioning. Accessible only by stairs, the apartments all feature a flat-screen TV, a safety deposit box, a fully equipped kitchenette and a bathroom with a shower, free toiletries and a hairdryer. Breakfast can be arranged on request and for a surcharge. The Tesco Supermarket in My can be found 1,300 feet from U Zeleneho jalovce and restaurants can be found within 150 feet from the property. Due to the central location, many sights can be seen on foot, the Charles Bridge is 1,650 feet away, the Wenceslas Square is 0.6 mi off and the Astronomical Clock can be seen on the Old Town Hall 800 feet from the apartment. The Pařížská shopping street is 1,150 feet away. The Staroměstská Metro Station is located 1,300 feet from the property, the Karlovy lázně Tram Stop is 1,500 feet away and the Vaclav Havel Prague Airport is located 9.3 mi from the property. Airport shuttle can be requested. When would you like to stay at U Zeleného jalovce? Located on the 4th floor in the attic, this apartment has a kitchenette, microwave and air conditioning. Please note that there is a low ceiling (the height of wooden beams is 71 in). Located on the 2nd floor, this air-conditioned apartment comes with a small kitchenette. Located on the 1st floor, this apartment comes with a small kitchen. Located on the 3rd floor, this apartment has 1 bedroom and a living room with a sofa bed, a satellite TV and a kitchen. Budova, ve které se apartmány nachází je kulturní památkou,která se nachází přímo v srdci historické Prahy.V těsné blízkosti se nachází ty nejznámější a nejkrásnější historické památky.Vítáme Vás u nás! House Rules U Zeleného jalovce takes special requests – add in the next step! U Zeleného jalovce accepts these cards and reserves the right to temporarily hold an amount prior to arrival. If you expect to arrive outside the official hours, please contact the property in advance. Check out after 10:00 is not possible. Please note that late check-in is available upon prior confirmation and for a surcharge. For groups of 3 - 4 people, a deposit of EUR 500 is required per apartment for incidentals. This will be returned at check-out, subject to a damage inspection. Please note that the final cleaning is not included. Please note that the towels are changed only for stays of 5 and more nights. On 24 December, check-in is possible only until 13:00. The location is simply perfect, right in the center. The apartment is big, clean and comfortable. The owner is really kind. Literally nothing could have been better. The apartment was literally amazing. Location genuinely could not be better, it was clean and spacious and Karen the owner was a fantastic host, so friendly and happy to help. We will 100% recommend this place to family and friends and hope to stay here again in future. Terrific location! The apartment was lovely and clean as well as being value for money! Very friendly apartment owner. Lovely warm welcome and he made sure we had everything we needed. Fab location, very near to shops, restaurants (definitely recommend the Fat Cat) and hopon hopoff bus stop. Note that the flat was on the fourth floor with no elevator. Also, the beams may be a hazard if you're tall. But if you're healthy and don't mind dodging beams, it's really a perfect little apartment! Beautiful, romantic flat in a great location. Hosts were responsive and accommodating. Exceptionally clean. Really a great choice. Very quiet, considering how close it was to the main route between the old town and Charles bridge. The best place to stay in Prague. Its impossible to be more central, everything was walking distance! The room was amazing and the host was really nice! the location is central,very close to astronomical clock and Jewish quartier. perfect to walk around. nice restaurants and shops.around. The host Karen could not have been more helpful - meeting me on arrival (I was earlier than scheduled arrival time) and was very keen to offer and share local tips and useful suggestions. The apartment had everything anyone could need and was super spacious! Location was so close to everything we wanted to see we could just walk.